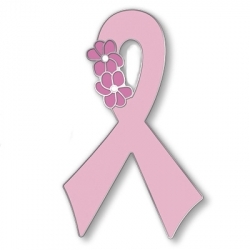 This pretty pink ribbon pin comes from the same design as our Survivor Pink Ribbon Pin. It is now available to all who support breast cancer awareness. This makes a great gift for your walk teammates, or supporters of your walks. It is a must for your pink ribbon pin collection. This is a great quality Cloisonne pin. Pin measures 1 1/4". If you like this pin, you will want to check out our Survivor Pink Ribbon pin.